Hollins University is the home of the newest chapter of Kappa Delta Pi (KDP), the international honor society in education. The Alpha Iota Rho chapter was officially established on campus this month with 21 inductees. The mission of this organization is to advance quality education by inspiring teachers to prepare all learners for future challenges. 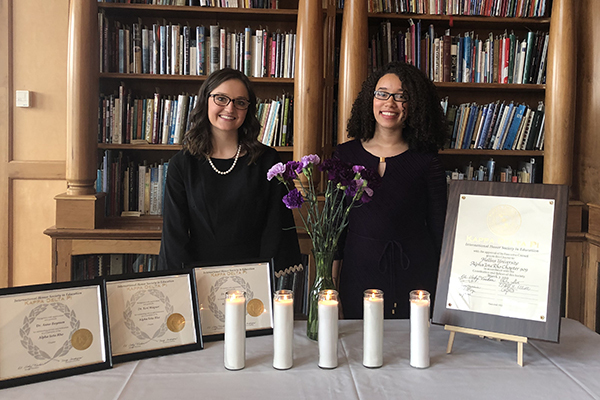 “Our goal is to have this newly installed society encourage all Hollins students and future educators to continue to achieve academic excellence at Hollins and beyond,” said Shalan Mitchell ’19 and Lindsey Grubb ’19, co-presidents of the chapter. To learn more about the Hollins chapter of Kappa Delta Pi, email kappadeltapi@hollins.edu. Photo caption: Lindsey Grubb ’19 (left) and Shalan Mitchell ’19, co-presidents of the newly established Kappa Delta Pi chapter at Hollins.